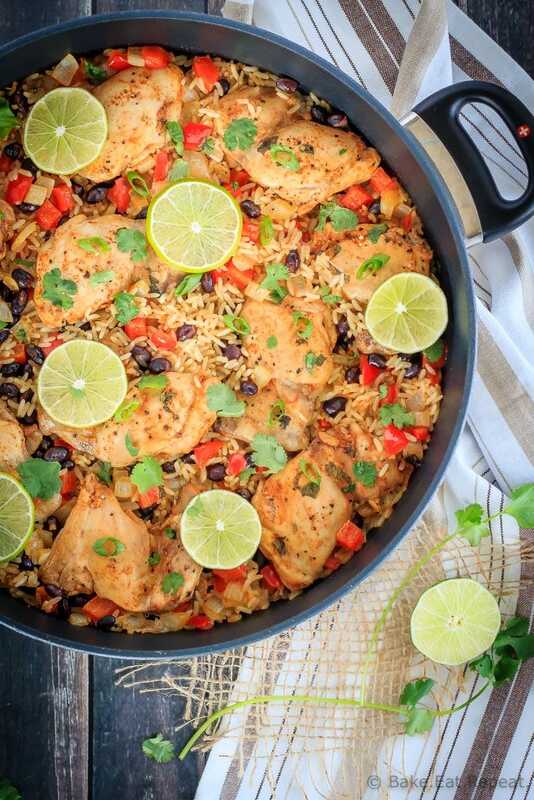 This one pot cilantro lime chicken and rice is a healthy, easy weeknight meal made in one pot that the whole family will love! Disclaimer: This post has been sponsored by USA Rice Canada and I have been compensated for my time. All opinions are, as always, my own. 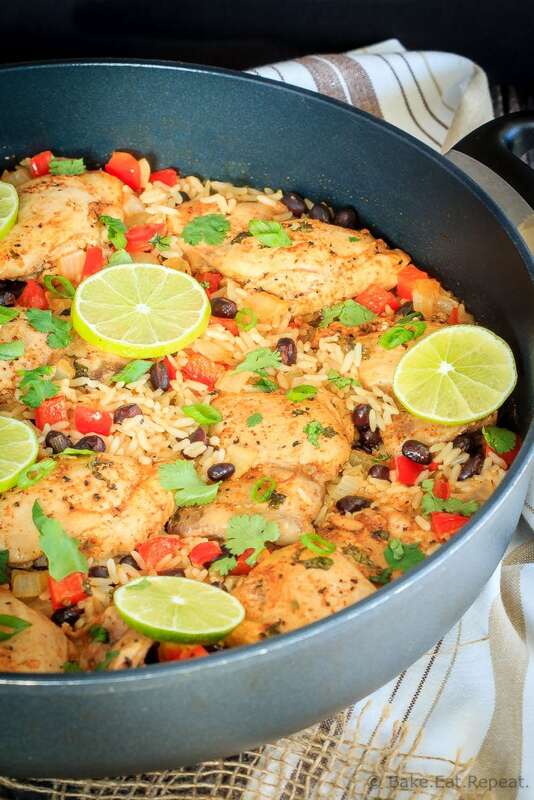 Who else loves one pot meals? I think that it’s one of my favourite ways to cook – a full meal in one pot. Less dishes, less effort, no worrying about what to serve with the main dish – love them. 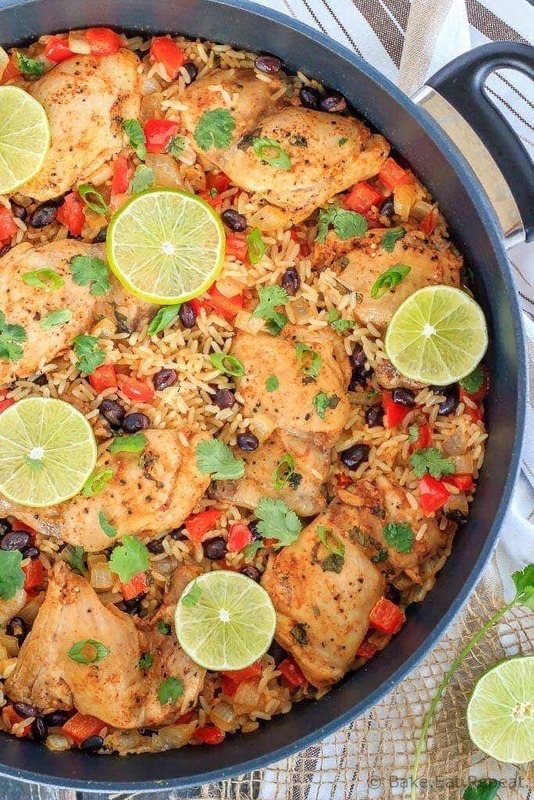 This one pot cilantro lime chicken and rice is definitely going to be a favourite meal around here. We love anything with Mexican flavours, and anytime I can load up a meal with cilantro and lime I’m definitely happy! I know there’s plenty of people out there that aren’t cilantro fans, my kids included, but they don’t have a problem with the cilantro in the marinade – and they just don’t sprinkle any on top of their portions. So we’re all happy. I think if you really don’t like cilantro you could leave it out of the marinade and this meal would still be fantastic. You definitely don’t need to garnish with it! Stick to green onions and it’s all good. I, on the other hand, will add as much cilantro as I can. It’s maybe my favourite part. No, wait. The lack of dishes. That’s my favourite part of this meal. Although I also love that it’s full of flavour, the whole family eats it happily, and it’s healthy. Rice is a nutritious and low calorie option that is also filling, tasty, and gluten free. It makes this recipe a full meal in one pot with very little effort. Rice is also naturally sodium and cholesterol free so it is a great healthy option for your meals. Since Canada does not grow rice, US grown rice is as local as it gets for us, and my family goes through plenty of it! It’s such a versatile and affordable option for feeding my hungry family. 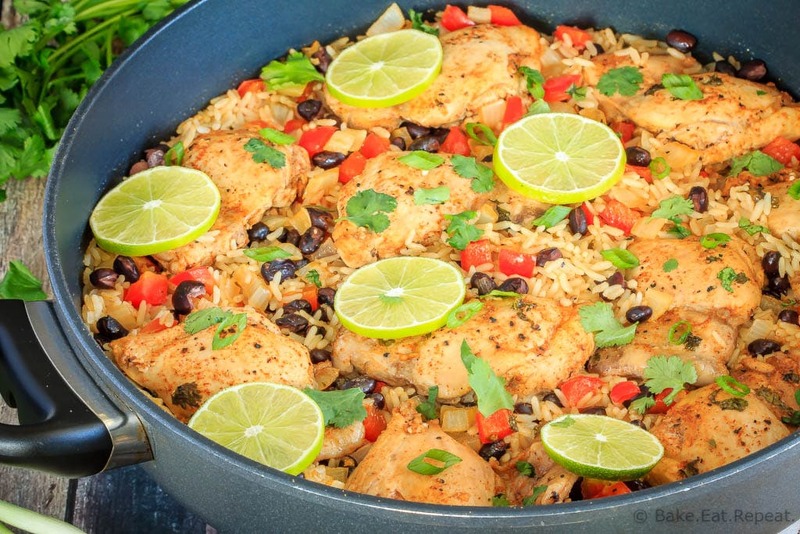 Try this easy one pot cilantro lime chicken and rice tonight for a healthy meal the whole family will love! The chicken needs to marinate for 30 minutes or up to 4 hours so plan accordingly – although if you’re pressed for time I think it would still be tasty if you just let it soak in the marinade while you chop the onion and red pepper and heat up the pan! I use long grain white rice for this dish, as that’s what my family likes, but it should work well with brown rice as well – just check the package directions for the amount of liquid to add and increase the chicken broth to match what your package says for one cup of rice. It may take a little more time to cook until tender too. There will be some liquid left in the pan when the rice and chicken are finished cooking – this is okay, it just makes the rice a bit saucy, but is delicious like this so don’t worry about it! You can leave the black beans out, or just add them at the table to your own portion if you have family members that dislike them. In a shallow baking dish, whisk together the olive oil, lime juice, salt, pepper, cumin, chili powder, paprika, garlic and cilantro. Add the chicken and turn it to coat with the marinade on all sides. Cover the dish tightly and refrigerate for at least 30 minutes and up to 4 hours. Heat a large skillet (with a lid) on the stove over medium heat. Place the chicken thighs, including the marinating liquid, into the hot skillet. Brown them, turning once to brown both sides, 2-3 minutes per side. Remove the chicken to a plate (leave any liquid in the pan). Add the chopped onion and red pepper to the skillet and saute for about 1 minute to soften. Add the rice and continue cooking, stirring, for one minute. Add the black beans and chicken broth and stir to combine. Return the chicken to the pot on top of the rice. It will be partially submerged in the liquid but not completely. Bring the liquid to a boil over medium heat, then reduce the heat to a simmer and cover the skillet. Cook at a simmer until the rice is tender, the chicken is cooked through, and most of the liquid has been absorbed, about 20 minutes. There will still be some liquid in the pot but this is okay! Serve with chopped fresh cilantro and chopped green onions. I used long grain white rice for this recipe. I think it would work fine with other types of rice, just adjust the liquid accordingly. For the rice I used, the package calls for 2 cups of liquid for 1 cup of rice. If your rice calls for a different amount of liquid, adjust the amount of chicken broth you use. The prep time doesn’t include the marinating time for the chicken - it needs to marinate for at least 30 minutes or up to 4 hours - so plan accordingly. I just got a Hot Pot, this looks like it would be a good fit, have you tried it? Do you mean Instant Pot? I don't have one yet so I haven't tried it, but let me know if you do!